pigs fly and fat ladies sing. | six words to change the world. ← delightfully hypocritical video for your weekend. pigs fly and fat ladies sing. Breathe deep, friends. I have some shocking news. The unthinkable has happened. 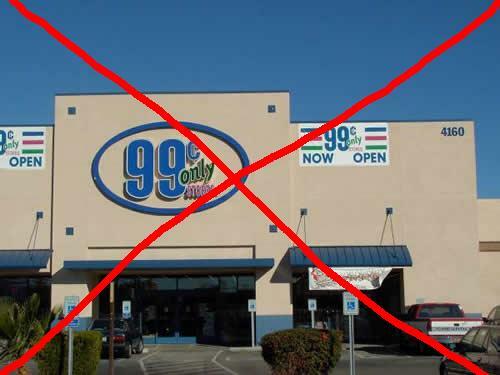 The 99 Cents Only Store, hailed by everyone themselves as “the oldest single-price point retail chain in the United States” (lots of competition for that title, I’m sure) is now making a mockery out of its name. And by a mockery, I mean that prices are going up and not all items in the store will be 99 cents. WHAT? EXCUSE ME? This is, for sure, a tragedy. What, or rather who, is to blame? Let’s examine the usual suspects… The bad economy? George Bush? Global warming? Nope. So let me get this straight. You shop at a 99 Cents Only Store because you are cheap. But because the cheapest of the cheap are stealing from the store for the cheap, those of us who are just cheap (but still have integrity) must suffer? Eek! My brain hurts. What are they going to do now? Become ‘The Store Formerly Known As The 99 Cents Only Store’? That maketing strategy worked for Prince. Having every item in the store under a dollar is their best marketing strategy. And as annoying (and impractical) as pennies are, there is a certain gratification when you get change back at a 99 cents store. The world will never be the same. Or you could just go to Dollar Tree.